I'm off to France in May via Brittany Ferries. Looking to go down South at a leisurely rate as taking a pillion. Also, Im definitely NOT camping as it always rains when i even think about it. Anyway, if other peeps would like to come along too give me a shout. 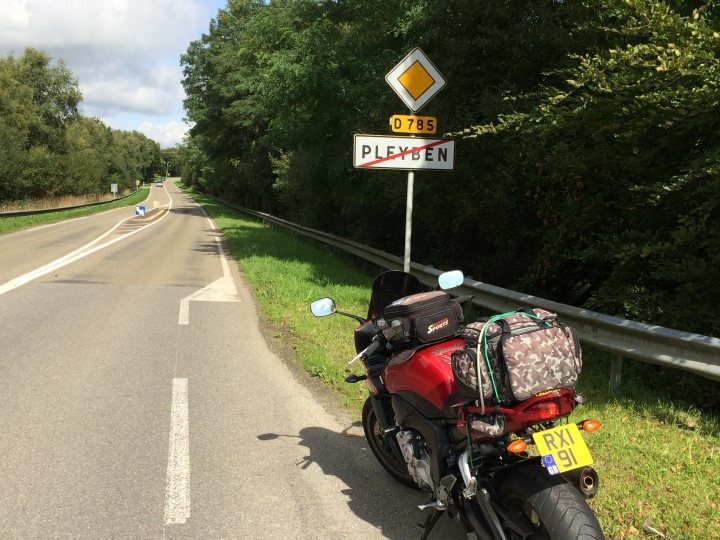 If you're heading down the West coast, look at the D785 from Morlaix to Quimper - nice start to the journey, like Dartmoor without speed limits & with sunshine. Cuts off the corner somewhat too. Even worth a detour if coming back early, head to Brest at Rennes & pick up the D785 again. Have fun, can't make it in May but will do something later in year. Kata - are you inviting us to share in your holiday or just the commute to where you're going? Eitherway I'd like more details please. Cheers for the info. Will add it to the list of places to look at for the trip. Share holiday - all or part. Im easy really. I havnt yet got a route or accommodation sorted but plan to get a route sorted by the end of the month then start booking hotels. Been wanting to get to that sodding big bridge down south of france for a while. Also stopping at Tours as the food is lovely. Sorry missed your post. You off to Scotland instead then? PM if you're still interested or wana have a chat about the route. Promoted on SWB Facebook page let’s see if we can generate some more interest. Sorry wasn’t clear I have promoted this link on the South West Bikers Facebook page to try and get more interest for you. There are over 900 follows of the page so let’s see if it helps get some interest. My route. Well roughtly via google anyway. Nice,we visited Carcassonne last year.Flew into Bezier and picked up a hire car. May I suggest you revisit your route? Well, it's your choice of course, but firstly I'd avoid the autoroutes if you "want to see France", and if you really want to use them then consider going down via the A75 "Meridienne" ....... Choosing the A20/A62 instead is like choosing the M4 from Swindon to Bristol over the A39 Atlantic Coast highway ....... Plus you get to go over the Millau ..... And the Autoroute from there to the med (at Beziers) is simply stupendous (as is most of the bit before). Otherwise, Carcassonne is a stunning place. Find somewhere in the old city (citadelle) if you can. Can't recommend anywhere as we stayed in a village about 20 miles south. We went down via the Meridienne and returned via the A20 ...... And the A20 is flat and boring in comparison. The Meridienne is mostly dual carriageway and quite twisty along with decent elevation changes (think A38 from Trago to Ivy bridge vs M5 from Taunton to Weston) and because of that a lot of lorries don't use it.